“Gossip Girl” star Kelly Rutherford has filed for divorce from her German entrepreneur hubby Daniel Giersch. Kelly, who is currently expecting her second baby this spring, filed the divorce papers on December 30 citing “irreconcilable differences.” According to People Daniel also filed for legal separation the same day. 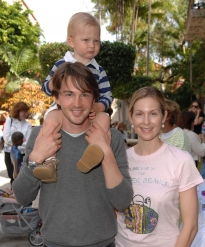 The couple were married in August 2006 and have a 2-year-old son, Hermés. Mom Changes Baby’s Bum – Finds A Bullet!